If you suffer from red bumps or a red rash around the neck area after shaving is usually razor rash or razor burn, medically known as Pseudo Folliculitus Barbae or P.F.B. This tends to occur around the more tender skin around the collar. Men who wear collar and ties for work have a much greater chance of getting razor rash due to friction of material against the skin. Using Aloe Clear roll on gel after shaving will greatly reduce the inflammation and prevent shaving rash, plus its roll on action means the application can be repeated throughout the day. The cooling, soothing feel of Aloe clear is very pleasant after shaving and has no excessive sting unlike other competitor’s products. Aloe Clear has a very light and pleasant menthol smell that give a feeling of wellbeing. Women can also prevent razor rash, in particular, in the bikini line area, under arms and on the legs. However, these shaving problems tend to be most common among women with darker hair growth or people of African-Caribbean descent. Razor rash is caused when a shaved hair curls and grows back into the skin. The body’s immune system recognizes the hair as an intruder and attacks it, creating red, inflamed areas. These red bumps are susceptible to infection and can easily turn into abscesses if neglected to long. Abscesses can be very serious and require surgery if left untreated. The infection in razor rash is caused by a bacteria called Staphylococcus aureus that infects the hair follicle. This can lead to redness, itching, and even small, puss filled pimples. The bacteria normally resides in our nasal passages without us realising it. Shaving can introduce the bacteria to hair follicles on the face, where it causes pain and irritation. Shaving right after a hot shower is a great idea. Shaving the easier areas first then take more time and care on sensitive areas. Try shaving in the direction of hair growth (usually downward). Not stretching your skin taut, remember if you suffer with ingrows then a really close shave is NOT what you want. Rinsing your razor thoroughly after each use and replacing your blades every week or more often if necessary. Avoid using triple blade razors as these simply shave too close if you suffer from razor rash or ingrown hair. Using an electric razor gently against the skin is another option to help prevent razor rash although many people suffer razor burn from electric shavers. 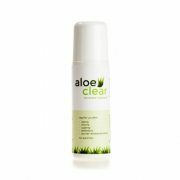 Aloe Clear intensely moisturises so should be use daily even on days where you don’t shave! Shaving with a blade razor is a skill and an art that traditionally barbers trained for for many years to perfect. The advent of the safety razor has made wet shaving mainstream throughout the last century and relatively easy compared to using the original “cut throat razor” which is very difficult to use safely. Most men think splashing some warm water on their face for a few seconds is enough to soften the beard ready for lather. The truth is that you should be using a clean flannel or towel and water hot enough so you can just put your hands in. So dip in the flannel in the hot water and wring out excess water and apply to you face until it cools down, then repeat 3 or four times particularly where the beard is coarsest. This will greatly soften the beard ready for lather. Proprietary cans of shaving foam are so convenient! On the surface of it these might seem the ideal way when learning how to wet shave. but it may be the worst choice you could make. These cans contain a propellant which can result in drying of the skin, So the manufacturers have to add artificial lubricants like silicones to try and offset this effect. But it doesn’t end there! Even more ingredients that have nothing to do with shaving are added, like stabilizers and preservatives. So at least look for a decent shave product out of a squeeze tube. Better still try a lathering shave soap or cream that is applied with a shaving brush. The brush plays a vital roll in the wet shave as the circular motions when applying lift the beard away from the skin and lubricates. So as a check list so far you will need a small flannel, a shaving bowl, soap stick and safety razor and a trusty Aloeclear 120 or 60ml roll on. Shaving in the right direction. Hair doesn’t just grow out from the body, it grows in directions which is are unique to each person. Studying your face on a day off from shaving will quickly show you your directions of growth. Stroking your hand across your face will demonstrate that some directions will feel rougher and some smoother. The smoothest direction is with the hairs the hairs grain for that area of your face. You may find the grain changing direction on different areas of the skin, so you need to learn and memorise your beards pattern and grain. Why is this important? Think of shaving not so much as eliminating hair but rather reducing hair it is after all going to start growing back immediately.You want to make shaving as comfortable as possible, avoiding irritation and nicks. The best way to do that is by initially shaving with the grain. If you want a closer shave, re-lather and shave against the grain. Caution though! This greatly increases the chances of razor rash and ingrown hair. Some people can shave against the grain without problem, but you really can only find out the hard way. By the way,it is far better to use a single or double edged blade when shaving against the grain as multi blade razors can result in the hair retracting too far and ingrown hairs and razor rash result. using too much pressure on the razor. Razor blades are at their most efficient when cutting across a flat surface. Pressing too hard creates a ditch that can cause irritation, cuts and nicks. Modern razors can at least partially compensate for too much pressure with things like suspension on the blades which also reduce the risk of moles and spots getting nicked.. Tilt your head to one side and rest the razor on your cheek thats the most pressure you should use on the razor which should glide over the skin not press in. Another common mistake even experienced wet shavers make, is trying to shave an patch of skin which has no lather. It seems we all miss those little bits in hard-to-get areas like the corners of the mouth or right under the jawline, and the natural reaction is to go back and give it another pass of the blade when we see it. Unfortunately, thats a recipe for a nick or cut. If theres no lather there then the blade drags on the skin and puckers it… next thing is your cut! Practically speaking, some people can get away with a short, light swipe at the very end of the shave with just water. But remember, even water can be classed as a partial lubricant. Paying attention to correcting these common mistakes will reduce the chances of irritation and increase your shaving satisfaction. We recommend that if you suffer from irritation after wet shaving you should apply Aloeclear at least twice daily. This will calm the skin and prevent ingrown hairs from forming. Redness around the collar will be a thing of the past. Plus you can carry a shave saver in your pocket to keep applying throughout the day.